Exciting day in maths today, we had our first proper lesson about adding. Last week we explored the concept of the number after, and this lesson built on that understanding. I am not introducing the + and = symbols or attempting to write down any mathematical thinking at this point. We are focusing on working in the concrete with resources and being able to talk about what we are doing. We took our first small step into the world of addition by learning how to ‘add 1 more’. The beads and threads are a great resource because they are arranged in a line and easy to hold up for the whole class to see. In this exploration, the children picked a thread and looked at the given starting number. I asked them to stick to 1 colour for the first addend to make it clear what they were doing. Then the added on ‘1 more’ and counted again to tell me how many there were. Some children of course were able to tell me the new total without having to recount, but I want children to be secure on this idea of adding and creating a bigger number before we vary the second addend. 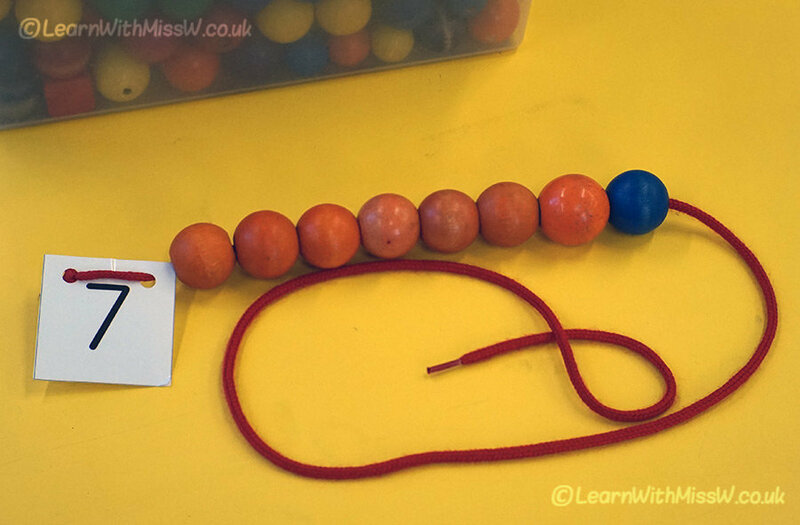 I used this activity both as an introduction to the concept of addition at teaching time, and also as a maths station to explore during the development of the lesson. You can download the threading cards and the adding spinner I use with it for free.